Beautifully upholstered with imported Italian top grain Black Leather . 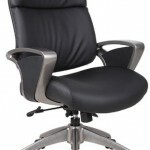 Executive High-Back styling with extra lumbar support. Pneumatic gas lift seat height adjustment. 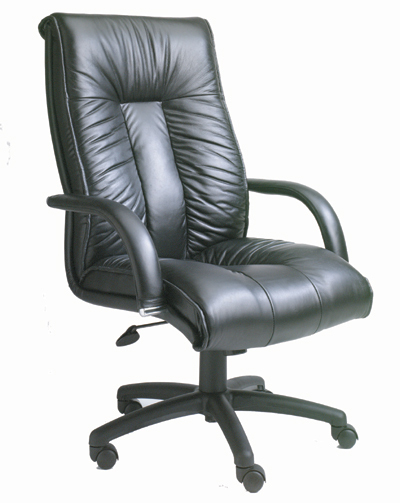 Leather upholstered armrests.Adjustable tilt tension control. Upright locking position. Large 27″ nylon base for greater stability.Hooded double wheel casters. Arm Height:26 – 30″H * Seat Size: 23″W x 22″D * Seat Height: 19″- 23″H. Overall Size: Overall Size: 28″W x 33.5″ D x 45″ – 49″H. Weight Capacity: 250lbs.